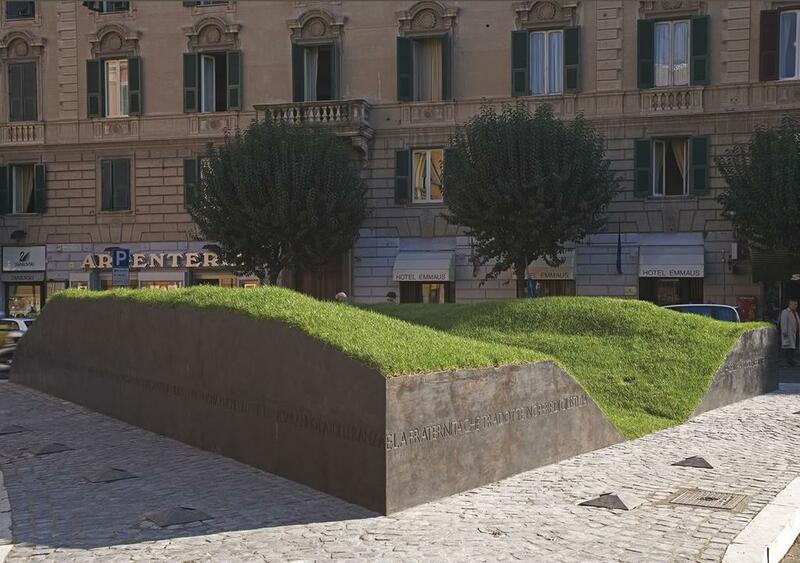 Materials: bronze, lawn, earth, supporting structure:reinforced cement. Dimensions: m 12 x 14 x h 1,6. 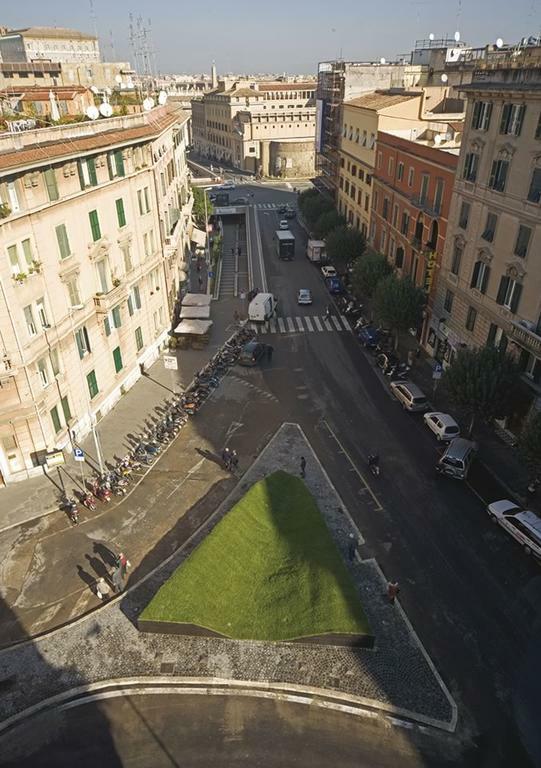 On the occasion of the fiftieth anniversary of the death of Alcide De Gasperi (Pieve Tesino - Trento, 1881 / Sella Val Sugana - Trento, 1954), the city government of Rome has chosen Maria Dompè’s project for a monument dedicated to him. The position of the work is the area in front of the house where he lived in the period after the war. De Gasperi is remembered not only for his anti-fascism and his defence of liberty, but also for his European vision that inspired his foreign policy at the end of the Forties. The common cultural roots are, in fact, the fundamental principles for the affirmation of democratic values in all of the countries of the “old continent”. The mnemonic function of the work does not react on the past, but on the future, as a stimulus to understand and augment the moral inheritance of the great Statesman. Therefore, the monument embodies his thought, instead of portraying his official self. 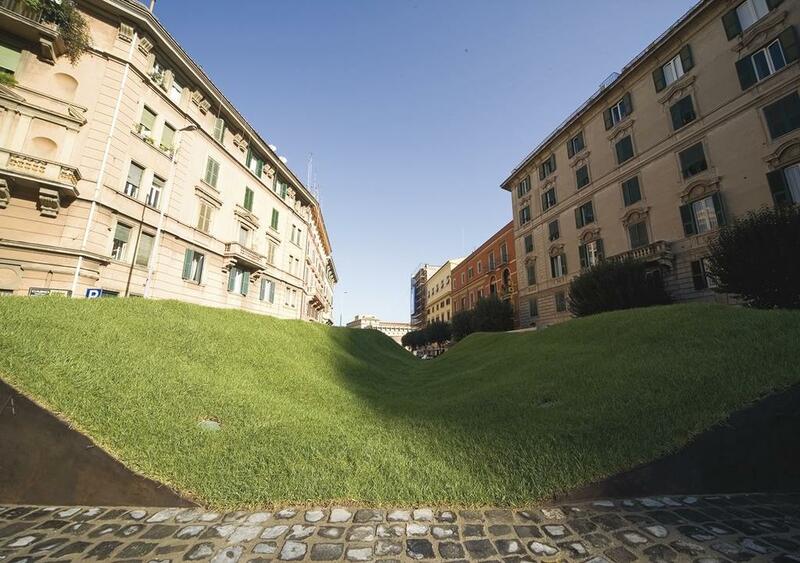 Bronze panels hold a green lawn, the “essence” of the valleys of Trento where De Gasperi was born. The triangle indicates movement, energy, tension in relation to the new. The posters of the first Avant-garde were full of similar signs, which celebrated progress and faith in its infinite potential. 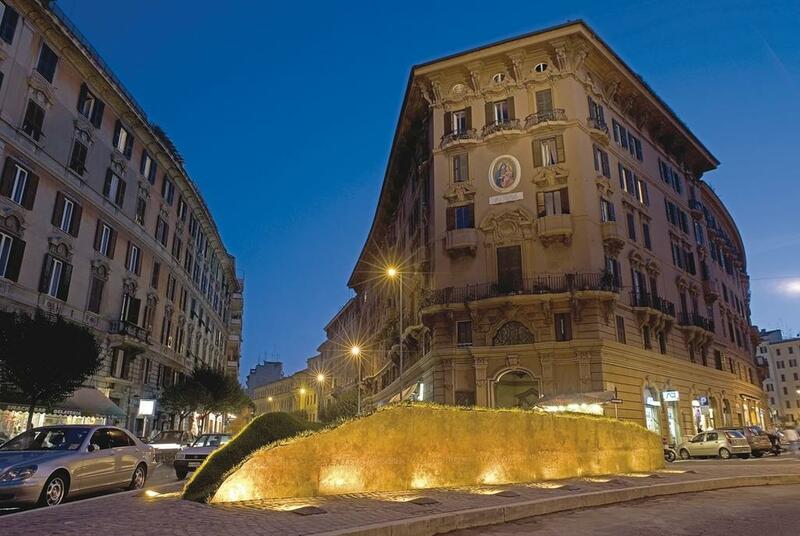 After more than a century, Maria Dompè performs an elegant gesture, “green tinting” the sculpture, as if to say that the environment, as always in her work, is the best investment for the future. The structure is similar to a bridge, a metaphor of union between opposite and non-communicating borders; this is the way the Europe of De Gasperi should be, founded on dialogue as a tool of mediation to resolve conflicts and integrate differences. Testifying to this, the phrases sculptured on the monument, incarnate his community idea: “European man must accept the experience of others, must learn to live within a larger community where he knows how to defend his own liberty and the liberty of others as well.” “Tolerance and fraternity, translated in works of justice and of peace on the social and international level, will give us the passport to European citizenship.” Love calls itself brotherhood socially and requires the spirit of sacrifice in the service of the community.” A spiritual witness, to which we derive inspiration in such a delicate phase of European history. From on high, the work seems like a kite, or a paper airplane: simple forms with which children, as always, create their dreams of liberty. 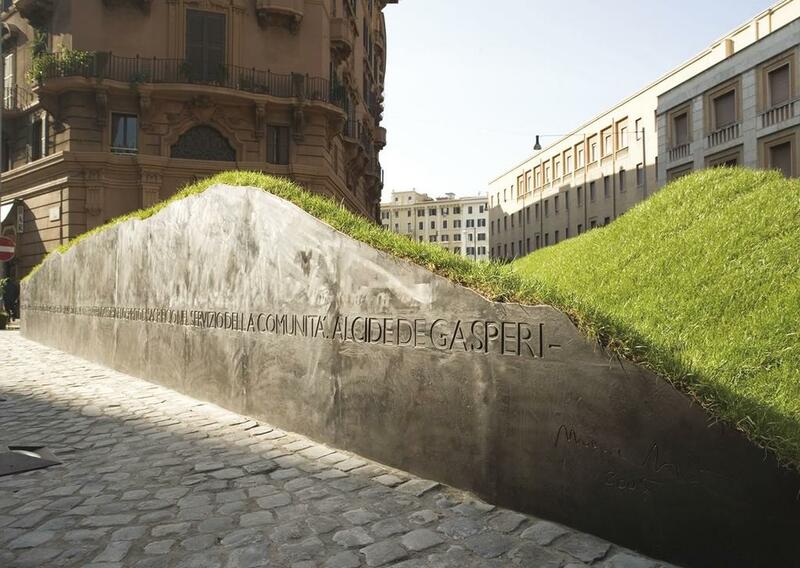 The same as De Gasperi, expressed by Maria Dompè with that “serious lightness”, which connotes, as always, her work.